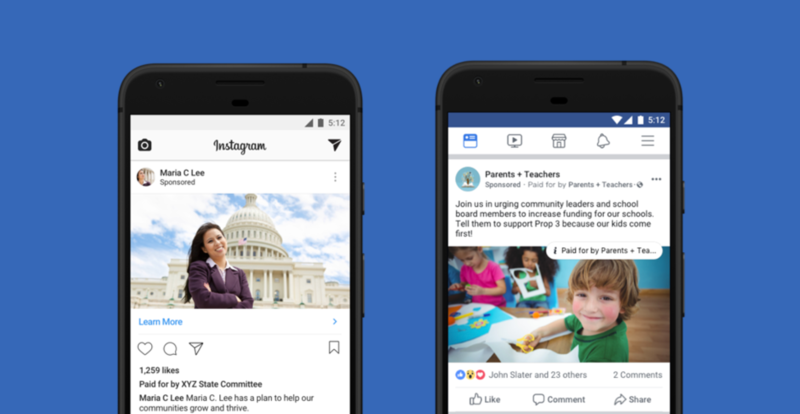 This is your guide to the Facebook and Instagram political ad label. We cover which posts must use the label and the 9 steps to get started. At first glance, you might think Facebook’s recently announced rules don’t apply to you; however, the rules extend well beyond traditional political ads, and apply to topics like “health,” “environment,” “economy,” “values,” and more. Given the broad coverage of these topics, some content producers (e.g. 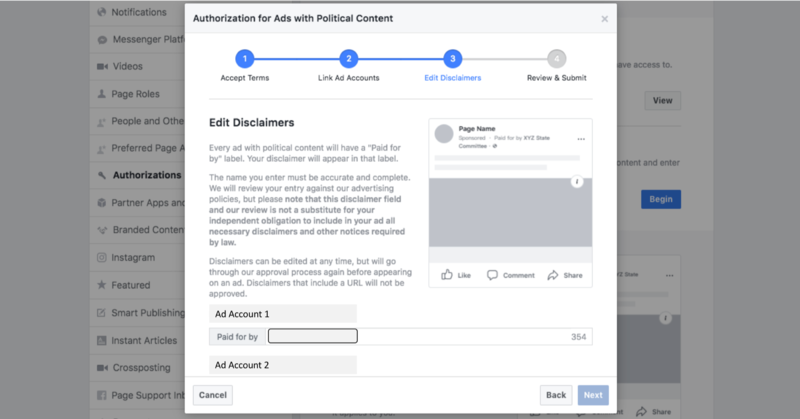 news publishers) will need to use the political ad label for a significant portion of their paid article and video posts (including boosted and dark/unpublished posts). It’s a non-starter to ignore the rules, and Facebook automatically blocks violating ads. This guide will ensure your team knows the rules and how to start using political ad labels. 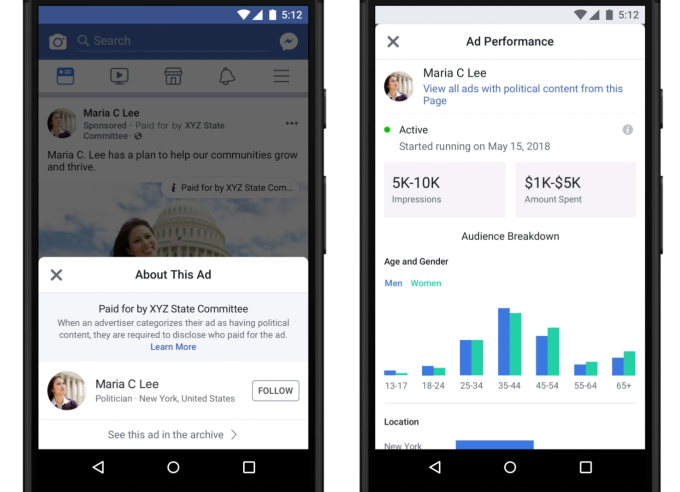 Any Facebook and Instagram ads covering topics that could be considered political must be labeled as a political ad by the ad creator. Below is a list of all ad topics that must be labeled ‘political’ - if your paid posts overlap with these topics, be sure to read the next section on how to start using political ad labels. Facebook notes that this is just an initial list, and that they expect the list to evolve. For now the rules only apply to ads targeting people in the U.S., but we expect similar rules will apply to more countries in the future. Political ads have a “Paid for by” label that the ad creator toggles during ad creation. Clicking the label provides a public disclaimer and directs the user to a public archive that includes information like ad budget, total audience reached and basic demographics. 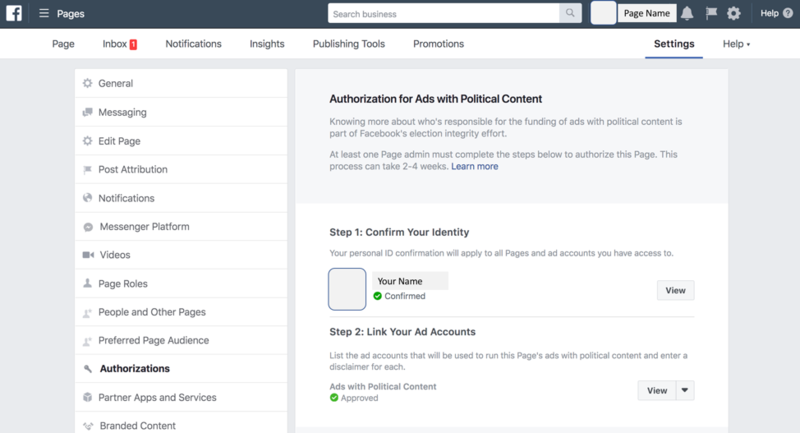 You have to apply for Facebook authorization to use the political ad label. Below are the application steps, which fall into 2 categories: (1) Identity Verification, and (2) Page/Ad Account Linking. Facebook notes the process can take up to 30 days, but we’ve found it can be completed in about 10 days assuming you have your ducks in a row. Each person who runs an ad for your team will need to complete Identify Verification, but only your Page Admin needs to complete Page/Ad Account Linking. You cannot proceed to Page/Ad Account linking until you complete ID Verification. You only need to complete ID verification once – it automatically applies to all Pages and ad accounts you have access to. Upload photos of your License or Passport. Ensure the images are high resolution, have no glare, and clearly show the edges of the document with a dark background. Facebook is not forgiving on these requirements. If your documents are rejected, you can appeal, but it takes 24-48 hours for each appeal, and it’s best to just take fresh pictures that 100% follow Facebook’s requirements. After completing ID Verification, visit your Page settings in Facebook business manager (e.g. https://business.facebook.com/YOURPAGENAME/settings/), and click “Authorizations” on the left menu panel. You’ll see that “Step 1: Confirm Your Identity” is complete, and you can then click "Begin" to initiate “Step 2: Link Your Ad Accounts". Provide a disclaimer for each Ad Account (400 character limit). Facebook's politics portal provides limited guidance on this, but you may want to check the Federal Election Commission (FEC) guide. While getting approval to use political ad labels takes time and patience, actually using the political ad label takes just a single click. 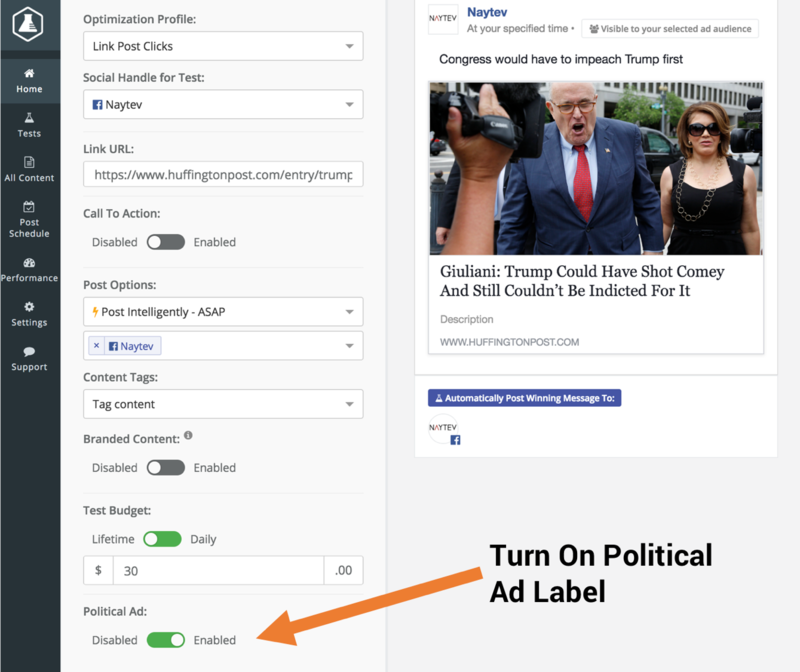 When using Naytev's social A/B testing to optimize your post performance, just turn on the Political Ad toggle during test setup (here’s a guide). 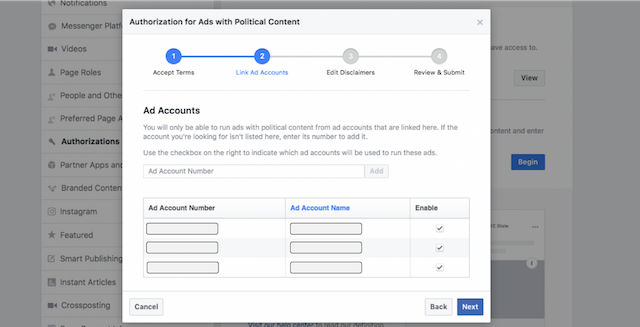 When using Ads Manager, just click the Political Ad check box in Facebook Ads Manager during ad creation.